YANGON—More than 100 members of the ruling National League for Democracy—from members of its youth wing to Myanmar State Counselor Daw Aung San Suu Kyi herself—have made the trek to China to promote bilateral relations since the party took power more than two years ago. China has taken steps to strengthen ties with Myanmar’s government and ruling party since the 2015 general election. And visits by NLD members to the neighboring country have only accelerated since the West began turning away from Myanmar in 2017 as the Rohingya crisis intensified in Rakhine State. NLD Central Executive Committee (CEC) members, lawmakers and youth wing members are being invited to China with increasing frequency on visits whose official purposes include promoting interparty relations with the Communist Party of China (CPC), sharing parliamentary experiences, goodwill visits, short study tours and youth leadership training. Many central committee members have visited China since 2016, according to NLD members who participated in the trips. Last week, 18 senior NLD members including the vice president of the party, the chief minister of Mandalay and the chief minister of Magway Region, headed to China for a nine-day goodwill visit. During the visit, the CPC showed off its achievements in the areas of international relations, rural development, agriculture, environmental protection and tax reform. The senior delegates met in Beijing with Huang Kunming, head of the CPC’s Propaganda Department and a member of the party’s politburo. The delegates visited the controversial Three Gorges hydroelectric dam. Spanning the Yangtze River, it is the world’s largest power generation facility with an installed capacity of 22,500 MW. Yet another delegation departed for China on Sept. 24, with nine Myanmar lawmakers embarking on a five-day “parliamentary goodwill” visit to Beijing. In what has become a familiar pattern, the delegates visited Beijing first and will end their trip in Kunming, the capital of Yunnan province, which shares a border with Myanmar. Along the way the Myanmar delegates will study the CPC’s leadership model, and China’s economic and social reforms, according to NLD delegates who have visited the country. According to the NLD’s website, official Facebook pages and D-Wave party newsletter, at least 110 NLD members including key players, lawmakers and youth wing members have visited China since 2016. In terms of the sheer number of delegates invited, China far outpaces other countries, according to Daw Ni Ni May Myint, an NLD lawmaker and central youth working group member. “China invites us a lot. Most countries invite only one or two delegates at a time, but China always invites more than 10 delegates from the NLD,” she said. 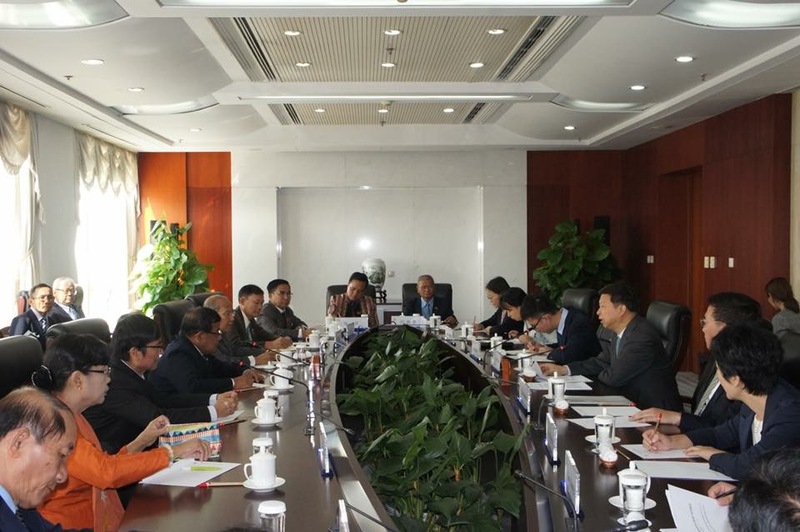 In October, 25 members of the NLD’s youth wing including leaders of its central youth working committee, will attend a six-day training session at Yunnan University in China’s Yunnan Province. She has previously visited China with other senior NLD members on legal study tours. NLD CEC member and party information officer Monywa Aung Shin told The Irrawaddy that the NLD has built a constructive relationship with China amid growing tensions with Western countries. “Meanwhile, Myanmar’s relations with China outweigh those of other countries,” said Monywa Aung Shin, who recently visited China on a tour to promote interparty relations. The CEC member admitted that China had become a good friend by showing more support for Myanmar’s peace process and standing by the country as it faces pressure on human rights issues from the West and Europe. Moreover, the NLD-led government has inked investment agreements with China while struggling with a decline in foreign direct investment from other sources. Historically, the countries’ bilateral relations have been marked by Beijing’s efforts to secure its interests in Myanmar and the region. After the 1990 elections, then-Chinese Ambassador Cheng Ruisheng was the first diplomat to call NLD headquarters to offer congratulations. When the electoral result was ignored by the then-military government, however, China went on to establish good relations with the dictatorship, building close ties with the military during a period of political repression. During that period, China was a key supporter of Myanmar’s military, providing it with assistance despite its record of human rights abuses, land-grabbing and exploiting the country’s natural resources. After Daw Aung San Suu Kyi was released from house arrest in November 2011, China maintained stable relations with the NLD. In December of that year, Chinese Ambassador Li Junhua met with Daw Aung San Suu Kyi at her residence—her first visit with a foreign diplomat since the 1990 elections. Since 2012, China has expanded its strategy beyond cultivating ties with the military and political parties by fostering relations with local intellectuals in Myanmar. China has invited local experts, businesspeople and journalists to Beijing to explain its projects and plans for the country. After its success in the 2012 by-election, the NLD sent two separate delegations of CEC members to China in May and June 2013. In its support for the successful 2015 general election, China demonstrated its willingness to work with whichever party won, in order to secure its ambitious infrastructure projects and to develop bilateral ties. 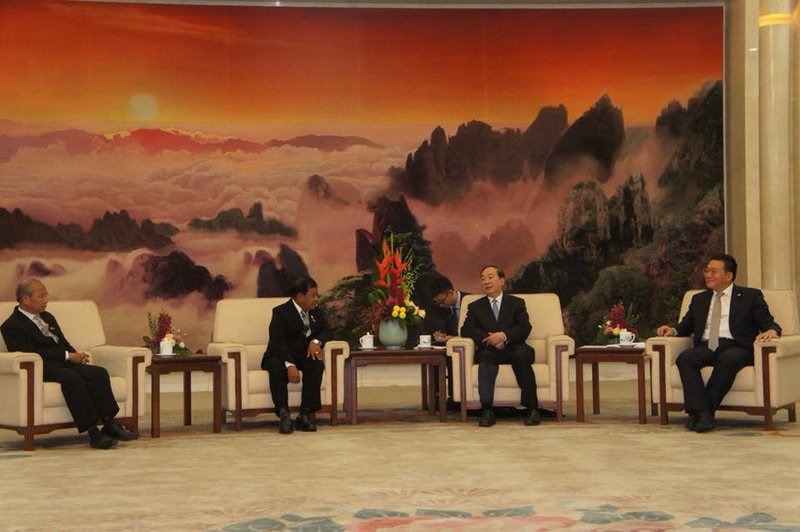 Daw Aung San Suu Kyi visited Beijing in June 2015, before Myanmar’s general elections in November of that year. The rare invitation to an opposition leader appeared to signal China’s belief that the NLD would win the election. After the 2015 election, the CPC used official channels to invite NLD lawmakers and youth members on short study tours, with a focus on sharing ideas on party discipline, leadership development, the agricultural sector and rural development. In December 2017, Daw Aung San Suu Kyi—by this time Myanmar’s de facto leader with the title of State Counselor—met with Chinese President Xi Jinping in Beijing during the CPC in Dialogue with World Political Parties High-Level Meeting. Xi promised that the CPC and the Chinese government would continue to develop bilateral relations with political parties, adhering to a policy of friendship with Myanmar and viewing bilateral ties from a strategic, long-term perspective. Daw Aung San Suu Kyi has visited China three times since becoming Myanmar’s State Counselor. Lawmaker U Wai Phyo Aung, who served as one of the 15 leaders of the NLD’s youth wing from 2014-2017, told The Irrawaddy that since the election, China has shown a willingness to build official party-to-party relations. 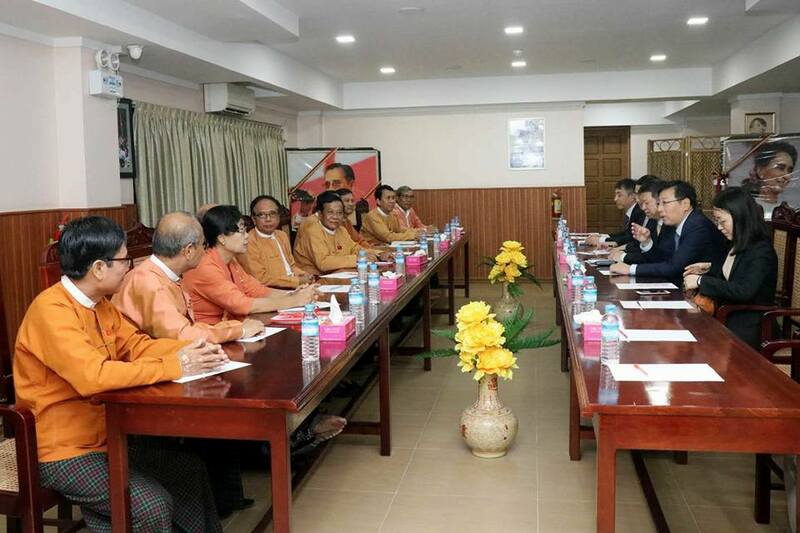 Previously, the CPC would extend invitations to NLD delegates via Chinese provincial governors. U Wai Phyo Aung led about 20 NLD youth members including some from ethnic states and regions, on a study tour to China in October 2016. He said the tour was mainly focused on youth leadership and regional development. However, some experts expressed wariness about China’s growing influence in Myanmar politics and questioned whether the CPC offers an appropriate model for Myanmar’s ruling party. “They have been trying to promote their own agenda [investments and projects] by inviting Myanmar people to visit,” said Khin Khin Kyaw Kyee, a lead researcher at the Institute for Strategy and Policy-Myanmar. “The countries have different political values; China’s government is known for centralization. If the ruling party [of Myanmar] uses China’s experiences as a model, it will dominate us,” she said. The Myanmar government has signed several MoUs with China without public hearings, and also put more restrictions on civil society organizations. These can be seen as the outcomes of the bilateral visits, Khin Khin Kyaw Kyee added. Experts point out that while Myanmar is facing heat from the West because of the Rohingya crisis in Rakhine State, Naypyitaw has proceeded to ink numerous agreements with Beijing, most notably an MoU establishing the China-Myanmar Economic Corridor, part of Xi’s Belt and Road Initiative (BRI), a vast international infrastructure development plan. The Chinese government has also made progress on expanding other ambitious projects in Myanmar, including the Kyauk Phyu Special Economic Zone, which secures a new transportation route allowing China’s oil imports to bypass the Strait of Malacca and gives China direct access to the Indian Ocean. The project will also boost development in China’s landlocked Yunnan Province. “We will have closer relations due to the [BRI],” Monywa Aung Shin, the NLD information officer, said. According to an in-depth survey by the International Growth Center, the space that has been opened by the government since 2011 for civil society and the public to voice their opinions has resulted in an increase in anti-Chinese sentiment in Myanmar. Chinese investments are at stake; a failure to engage with local communities could make Myanmar a more difficult place for Chinese companies to do business, according to the center. China has lobbied the government to restart the controversial Myitsone Dam project in Kachin State. The project was suspended during the administration of former President U Thein Sein amid widespread public concern about the dam’s social and environmental impacts. Experts warn that the NLD needs to understand that in general, public sentiment towards China remains negative.